Did you know that the average American drives 13,474 miles a year? i That equates to over 1,000 miles a month and almost 40 miles a day! As a society that is always on the go, we rely on our roads to be constructed efficiently to get us to-and-from work, social gatherings, and school. 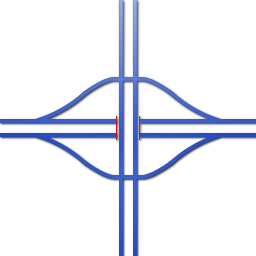 This is a relatively popular interchange because it only requires one bridge that is constructed between the perpendicular and the leading routes. Construction of this interchange is relatively inexpensive because of this. A factor to consider when evaluating this interchange is the need for a large amount of land, as this interchange takes up a lot of space. Another disadvantage to this interchange is it can only serve a low capacity of traffic and because of this, cloverleaf interchanges are typically found on older roads in rural areas. “The diamond interchange is the most common type where a major facility intersects a minor highway. The design allows free-flow operation on the major highway but creates at-grade intersections on the minor highway with the ramps.” iii Unlike the cloverleaf interchange, the diamond interchange is suitable for both rural and urban areas. The diamond interchange also doesn’t take up much space, and therefore is relatively economical to construct. 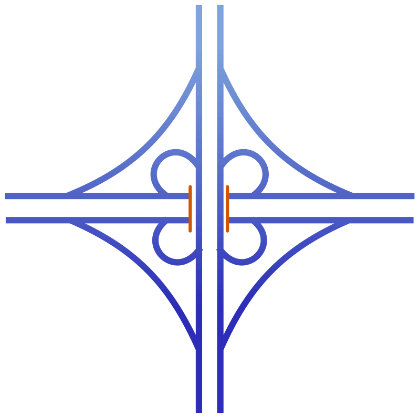 The main disadvantage to the diamond interchanges is the possibility of congestion. For example, if a car is attempting a left-hand turn after exiting another roadway, traffic may build up behind that car if the traffic on the cross road prohibits the car from turning at a reasonable time. This can cause traffic to back up the exit ramp and may even cause congestion on the original road the car was exiting from.